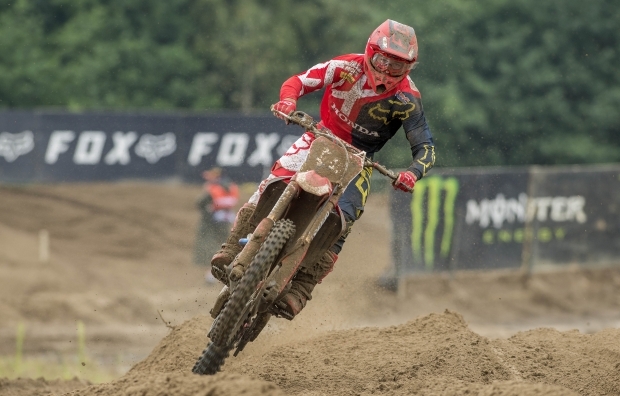 Tim Gajser claimed a seventh-place finish at the end of the MXGP of Belgium, which drew to a close today at Lommel. Despite an up-and-down overall performance, the Team HRC rider has chipped away his gap to third place and he is now only 25 points away from Clement Desalle.… read more. The MXGP of Belgium saw Calvin Vlaanderen’s podium streak come to an end as the Team HRC rider was sixth overall at Lommel with a fifth and a seventh in the two MX2 World Championship motos aboard the all-new Honda CRF250RW. With fifteen events out of twenty completed for the… read more. Team HRC’s Tim Gajser has qualified in 11th place for the two MXGP races of the Grand Prix of Belgium, which will be contested tomorrow from 14:15 and 17:10 local time (GMT +2) at Lommel. 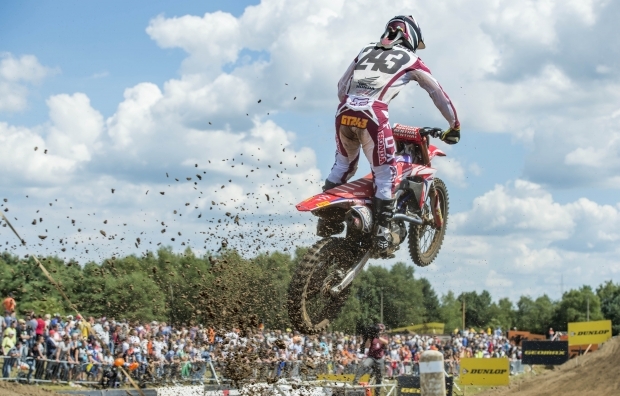 Gajser’s team mate Todd Waters finished the moto in 22nd position under the excruciatingly hot… read more. 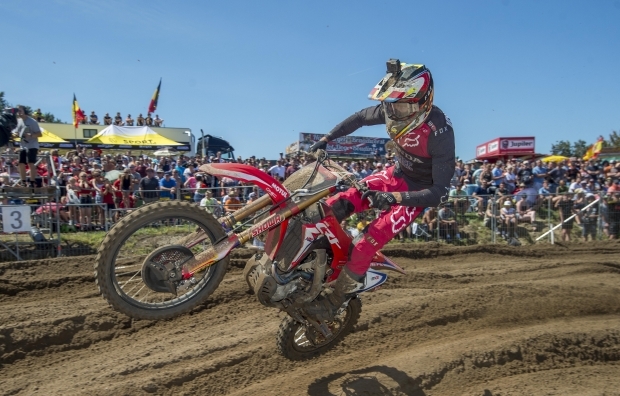 The MX2 qualifying race for the tenth round of the 2018 MXGP World Championship saw Team HRC’s Calvin Vlaanderen claim fifth place aboard his Honda CRF250RW, after a smart and encouraging performance on the deep sand of Lommel – in an unusually hot midsummer Saturday in Belgium. After coming out… read more. Team HRC is back in action this weekend as the 2018 MXGP World Championship heads to Belgium for the fifteenth round of the season, which takes place at the iconic Lommel motocross venue. Considered one of the most challenging tracks on the calendar, Lommel will be a big test for… read more. 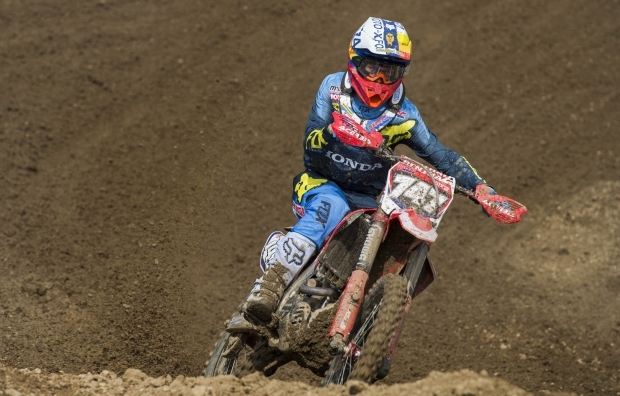 Michele Cervellin and Jed Beaton had a frustrating day at the MXGP of Belgium, as they fought their CRF250RW’s round Europe’s toughest track. Michele, who has been in and out of hospital since Czech Republic, found himself struggling with his fitness. As he has been unable to ride or train… read more. 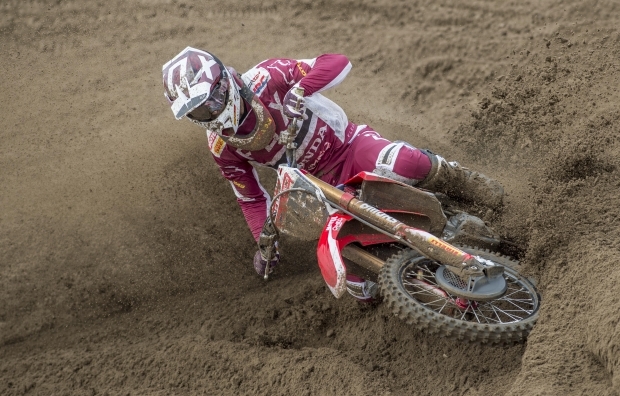 Team HRC MXGP riders Tim Gajser and Evgeny Bobryshev found luck wasn’t on their side today as they bashed through the Belgium sands on their CRF450RW’s, on a track labelled as; ‘the most challenging track’ on the MXGP calendar. With no more rain overnight, the track had a chance to… read more. 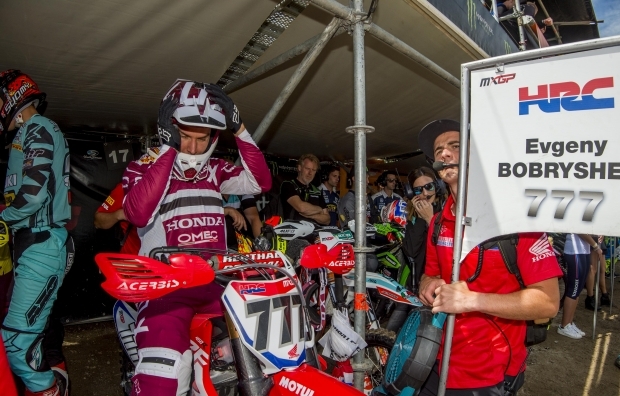 HRC MX2 riders Jed Beaton #14 and Michele Cervellin #747 had a steady start to the MXGP of Belgium today on their CRF250RW’s as they both finished inside the top 20. After putting in some work this week, Jed had a strong start out the gate, managing to keep with… read more. 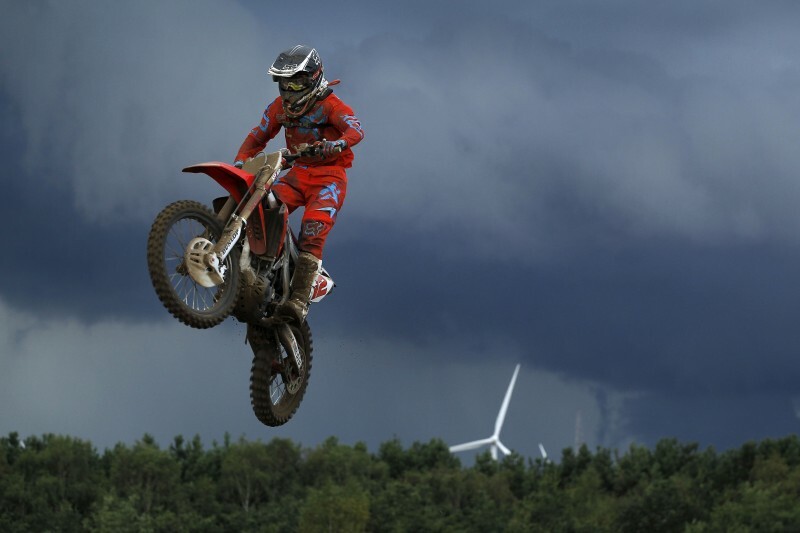 Heavy rain showers add to the challenging conditions today in Lommel as Gajser took third overall on his CRF450RW, in the qualifying race at the MXGP of Belgium. The changeable weather saw torrential rain showers following bright spells of sunshine today, leaving the track sodden with some areas completely under… read more. 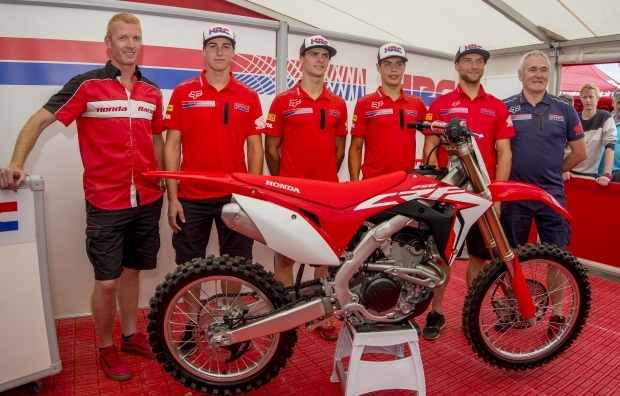 All-new CRF250R features DOHC engine with 9% more power Shares frame, Showa forks and ‘Absolute Holeshot’ philosophy of CRF450R New machine set for racing debut at USA round of MX2 in September The all-new 2018 Honda CRF250R was unveiled today at the MXGP of Belgium by Honda’s Team HRC factory… read more. Round 14 and the first of a series of back to back races, HRC MX2 head to the deep sands of Lommel for the MXGP of Belgium. After Beaton’s impressive debut at the MXGP of Czech Republic with HRC, he will be looking to better his starts this weekend to… read more. As the season slowly starts to draw to an end, team HRC MXGP head to Lommel this weekend in the first of a series of back to back races, for the MXGP of Belgium. 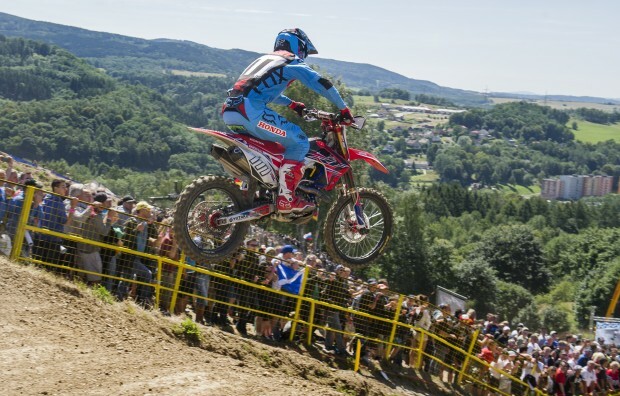 Gajser’s much awaited return to the podium in Czech has spurred the Slovenian on to finish… read more. 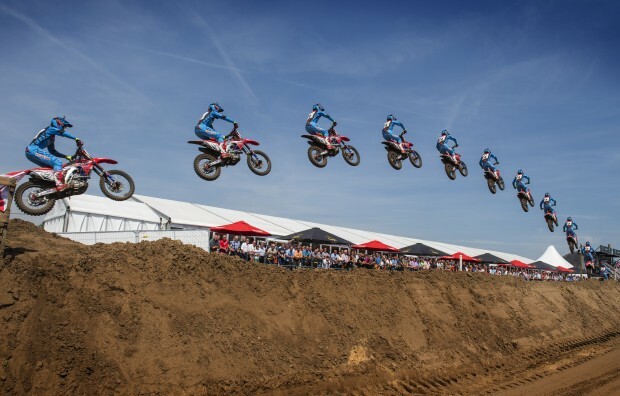 After the success of the first MXGP3 competition ran in the lead up to the MXGP of Czech Republic, Milestone and Honda have teamed up again for the MXGP of Lommel on the 5th and 6th August. 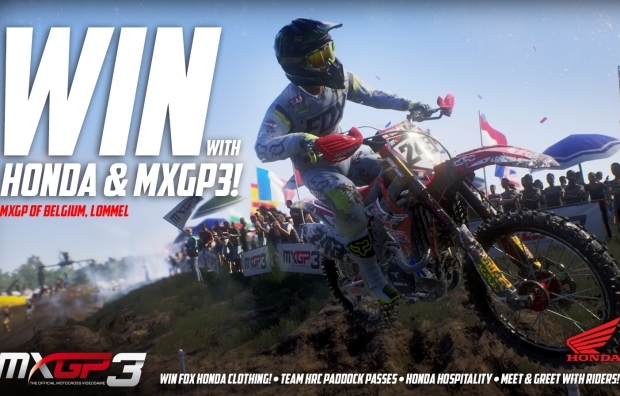 Honda and MXGP fans will be able to bag themselves some Honda Fox… read more. 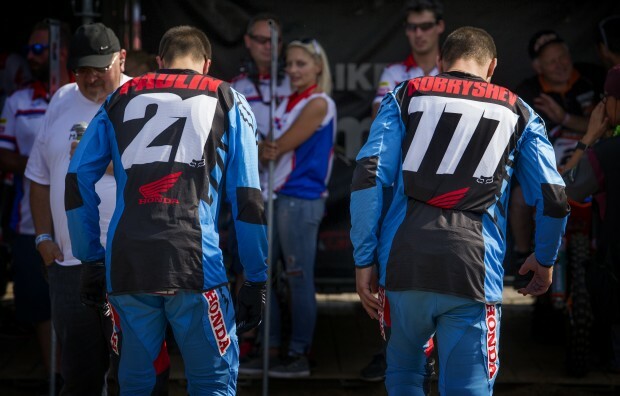 Both Evgeny Bobryshev and Gautier Paulin were forced into recovery mode for today’s two races in Lommel, each time having to come through the field from towards the back of the pack. Bobryshev started with the disadvantage of the very widest gate pick, but made the best of the situation… read more. 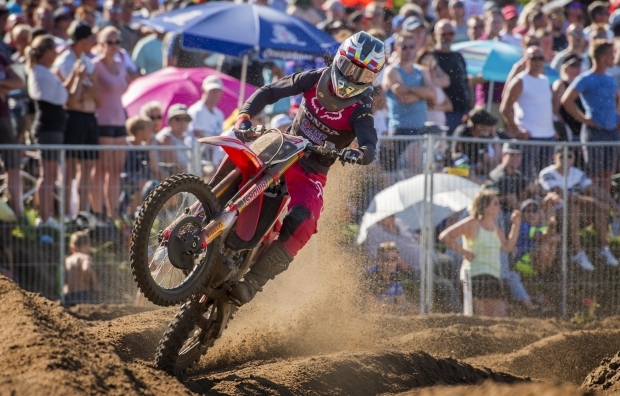 On the opening day of the MXGP of Belgium, Honda and Honda Racing Corporation followed the qualifying race by presenting the factory line-up for the Monster Energy Riders’ Cup. 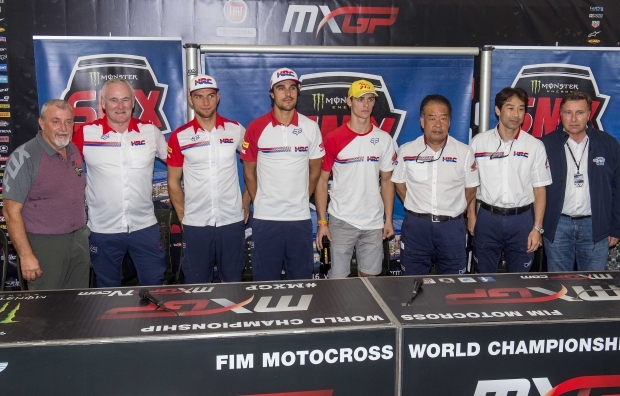 Team HRC’s Evgeny Bobryshev and Gautier Paulin were joined by Honda Gariboldi Racing’s Tim Gajser, forming the trio of riders all… read more. 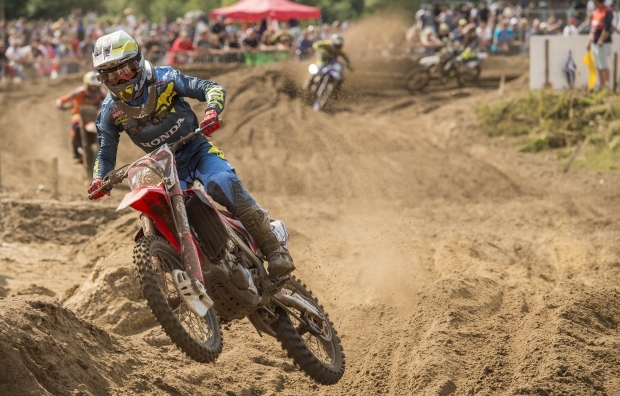 Round 14 of the MXGP World Championship takes Team HRC to Belgium and the revered Lommel track. 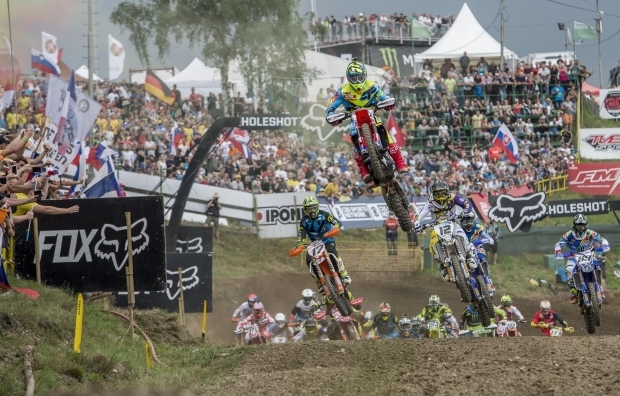 Just one week after the MXGP of the Czech Republic, it’s the middle of a triple back-to-back of races as the 2016 season starts its final hurrah. 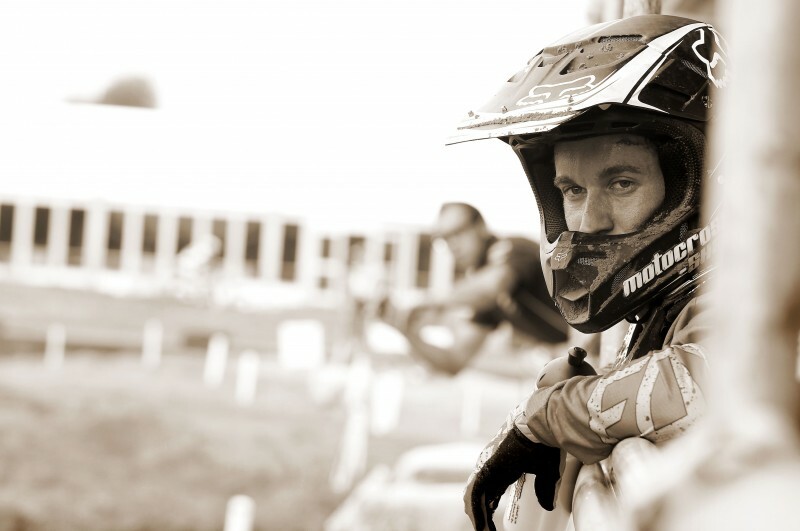 Last year Gautier Paulin, still nursing… read more. With motocross often comes the need to fight through injury and pain, and Gautier Paulin demonstrated today that he could do that in spades. 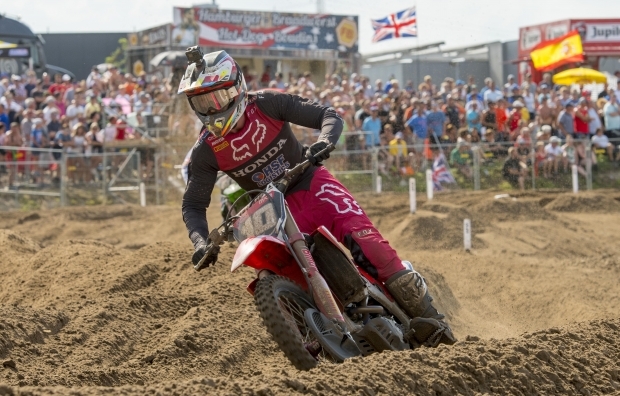 Carrying the right knee injury sustained just last weekend in the Czech Republic, coupled with the fact that this weekend Lommel was even more rutted and… read more. 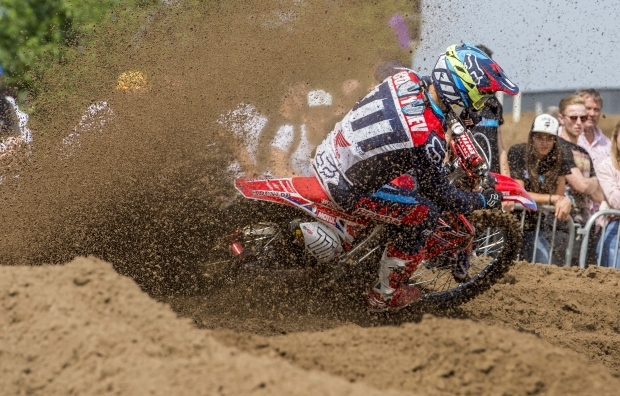 Evgeny Bobryshev and Gautier Paulin finished sixth and seventh respectively in qualifying for the MXGP of Belgium today in the demanding sand of Lommel. With a packed running schedule, the track became increasingly rutted and bumpy as the day progressed, leading to a few mistakes and crashes throughout the pack.… read more. Just one weekend after Loket, Team HRC are back in action at the MXGP of Belgium where the punishing sand of Lommel beckons. 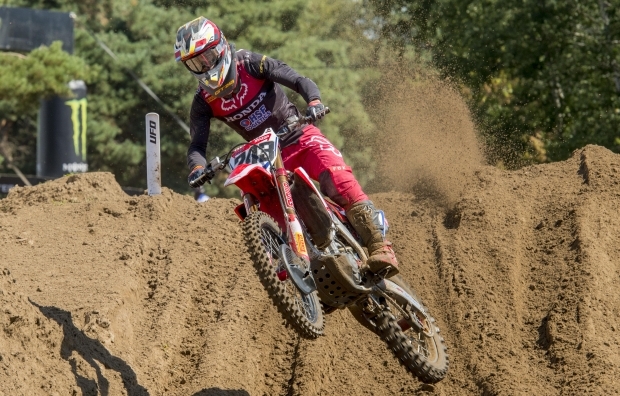 The sand track of all sand tracks, Lommel is a demanding and unforgiving venue and with a mammoth nine races including support classes on Sunday, it will… read more. 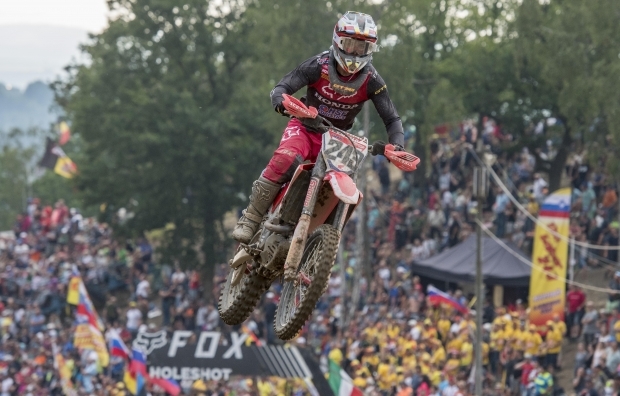 The MXGP of Belgium started in the best way for Team HRC as Max Nagl took the holeshot in race one, leading through the first corner after another blinding start. After yesterday’s busy track schedule, Lommel had become characteristically rough by the first race today, and as Nagl predicted after… read more. 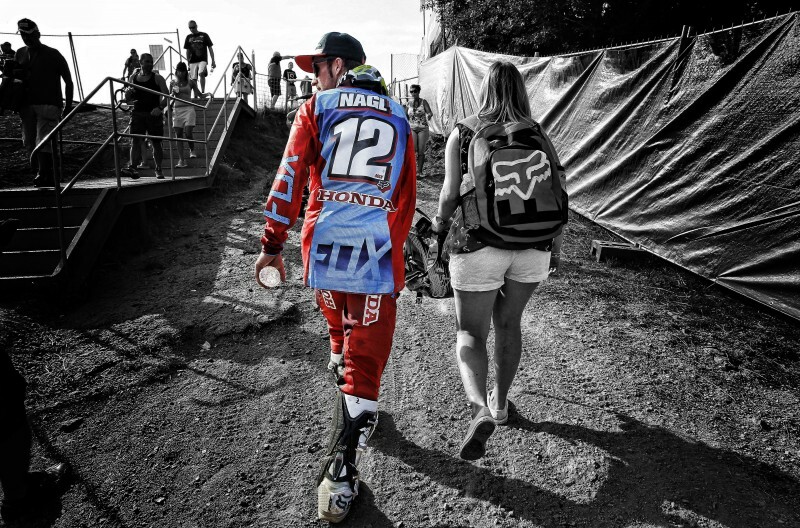 Team HRC’s Max Nagl finished the qualifying race for the MXGP of Belgium in eighth place today. Nagl started the qualifying race from 14th position after the morning’s timed practice, which put him in an outside gate position for the start. He made a good gate jump and was at… read more. This weekend, Belgium will play host to the final European round of the MXGP season at the Lommel track, west of Antwerp near the Dutch border. Steeped in motocross history and heritage, Lommel is a beast of a track – deep and loose sand, big ruts that get more treacherous… read more.